Background: A study was undertaken to investigate whether bronchodilators are associated with less breathlessness at rest and during light exercise in patients with moderate to severe chronic obstructive pulmonary disease (COPD) with resting tidal expiratory flow limitation (EFL; flow limited (FL)) compared with those without EFL (non-flow limited (NFL)). Methods: Twenty subjects (13 men) of mean (SD) age 65 (8) years (range 43–77) suffering from COPD with forced expiratory volume in 1 second (FEV1) 47 (18)% predicted were studied before and after inhalation of salbutamol (400 μg). Routine pulmonary function tests were performed in the seated position at rest. 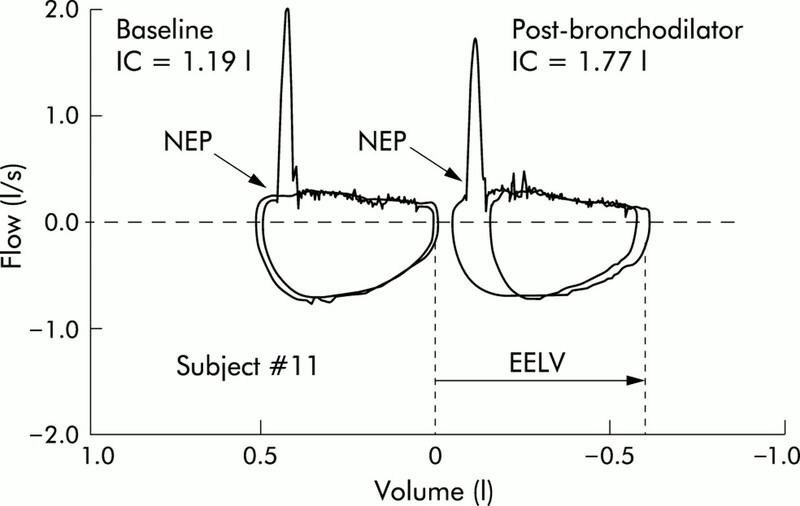 EFL was assessed by the negative expiratory pressure (NEP) method and changes in end expiratory lung volume (EELV) were inferred from variations in inspiratory capacity (IC). Dyspnoea was measured using the Borg scale at rest and at the end of a 6 minute steady state exercise test at 33% of the maximal predicted workload. Results: EFL occurred in 11 patients. Following salbutamol IC did not change in NFL patients but increased by 24% (95% CI 15 to 33) in FL patients (p<0.001). Maximal inspiratory pressure (Pimax) improved at EELV from 45 (95% CI 26 to 63) to 55 (95% CI 31 to 79) cm H2O (p<0.05) in FL patients after salbutamol but remained unchanged in NFL patients. The workload performed during exercise amounted to 34 (95% CI 27 to 41) and 31 (95% CI 21 to 40) watts (NS) for patients without and with EFL, respectively. After salbutamol, dyspnoea did not change either at rest or during exercise in the NFL patients, but decreased from 0.3 (95% CI –0.1 to 0.8) to 0.1 (95% CI –0.1 to 0.4) at rest (NS) and from 3.7 (95% CI 1.7 to 5.7) to 2.6 (95% CI 1.1 to 4.0) at the end of exercise (p<0.01) in FL patients. Conclusions: Patients with COPD with EFL may experience less breathlessness after a bronchodilator, at least during light exercise, than those without EFL. This beneficial effect, which is closely related to an increase in IC at rest, occurs even in the absence of a significant improvement in FEV1 and is associated with a greater Pimax. Since a decrease in dynamic hyperinflation should reduce the threshold inspiratory load due to PEEPi and increase the inspiratory muscle strength, we hypothesised that less breathlessness should occur following bronchodilators during mild to moderate exercise and even at rest in COPD patients with resting tidal EFL. This study was therefore undertaken to assess variations in resting lung volumes and inspiratory muscle strength and changes in dyspnoea, both at rest and during light exercise, after inhalation of a short acting β2 agonist in patients with moderate to severe COPD with and without resting tidal EFL. Twenty consecutive subjects (13 men) of mean (SD) age 65 (8) years (range 43–77) suffering from COPD according to the American Thoracic Society (ATS) criteria13 were studied as outpatients at the Department of Internal Medicine of the University Hospital of Brescia. The patients were in a stable condition with airflow obstruction (forced expiratory volume in 1 second (FEV1) 1.13 (0.41) l corresponding to 47 (18)% predicted and a ratio of FEV1 to forced vital capacity (FVC) of 50 (13)%). None of the patients suffered from other respiratory, cardiac, or neuromuscular disorders or had a respiratory infection during the previous 2 months. No patient was taking oral β2 agonists, theophylline or systemic corticosteroids, or had received inhaled short acting β2 agonists or anticholinergic drugs for 8 hours before the study or long acting β2 agonists for 24 hours before the study. Each patient gave informed consent and the protocol of the study was approved by the local ethics committee. The patients were studied at rest in the morning while seated under baseline conditions and 20 minutes after administration of 400 μg salbutamol through a metered dose inhaler and inhalation chamber. Both the dosage and method of administration were chosen to maximise the effect of the drug. Dyspnoea was assessed at rest and at the end of a 6 minute steady state exercise test performed by a cycloergometer pedalling at 33% of the predicted maximal workload14 before and after salbutamol. EFL was assessed by the negative expiratory pressure (NEP) method18 when the patients were seated upright, breathing through the equipment assembly while wearing the nose clip. The experimental set up used to assess EFL by NEP was similar to that described in detail previously.12 During the NEP trials V̇ was measured with a Hans Rudolph pneumotachograph with a linearity range of ±2.6 l/s (model 3700A) connected to the mouthpiece and a differential pressure transducer (DP55 ±3 cm H2O; Raytech Instruments, Vancouver, British Columbia, Canada). Pressure was measured at the airway opening (Pao) via a rigid polyethylene tube (internal diameter 1.7 mm) connected to a differential pressure transducer (DP55 ±100 cm H2O; Raytech Instruments). Data analysis was performed using Direc (Version 3.1; Raytech Instruments) and Anadat (Version 5.2; RHT-InfoDat, Montreal, Quebec, Canada) data analysis software. Under baseline conditions and after inhalation of salbutamol, several NEP tests (–5 cm H2O) were performed at intervals of 6–8 breaths after a period of about 60 seconds of regular breathing to measure the average breathing pattern parameters: tidal volume (Vt), respiratory frequency (f), inspiratory (Ti) and expiratory time (Te). The test breath was the one during which NEP was applied during expiration, and the preceding expiration served as a control. Chronic dyspnoea was assessed before experiments using the modified Medical Research Council (MRC) dyspnoea scale3 with verbal descriptors starting from zero (not troubled by dyspnoea) up to a maximum value of 5 (dyspnoea with minimal effort). Dyspnoea was defined as “an unpleasant sensation of laboured or difficult breathing”. Under baseline conditions and after salbutamol the intensity of dyspnoea was measured using the modified dyspnoea Borg scale19 with which the subjects were made familiar before the study, both at rest and at the end of exercise. On each occasion changes in dyspnoea were quantified according to the score difference (ΔBorg) before and after administration of the bronchodilator. The patients were categorised as flow limited (FL) and non-flow limited (NFL) according to the results of the NEP tests at baseline.2,12 If NEP elicited an increase in expiratory flow over the entire range of control Vt, the patient was classified as NFL. In contrast, if during the NEP application the expiratory flow did not increase relative to that of the preceding control Vt throughout the whole or part of expiration, the patient was classified as FL. The same approach was followed after administration of salbutamol. Descriptive group data were compared using the unpaired Student's t test. Statistical comparisons were performed using the Wilcoxon matched paired signed ranks test for the Borg score before and after the bronchodilator in both the NFL and FL groups and the Mann-Whitney test was used for changes in dyspnoea between the two groups. Regression lines were obtained according to the least squares method. Correlation analysis of the Borg score was established using the Spearman's correlation coefficient, a non-parametric equivalent. Data are expressed as means and 95% confidence intervals (95% CI) unless otherwise specified; p values of <0.05 were considered significant. Under baseline conditions 11 patients exhibited tidal EFL at rest, complete EFL in five and partial EFL in six (fig 1). The anthropometric and functional characteristics of the FL and NFL patients are shown in table 1. Reversal of EFL occurred after salbutamol in three patients with partial EFL. Significant reversibility of bronchial obstruction was observed in five patients (25%), two NFL and three FL of whom one became NFL. Tidal flow-volume curves at rest immediately before and after the application of negative expiratory pressure (NEP) in a representative flow limited COPD patient under baseline conditions and after the administration of the bronchodilator salbutamol. Although expiratory flow limitation at baseline was not abolished by salbutamol, a substantial increase in inspiratory capacity (IC) was obtained, reflecting a marked decrease in the end expiratory lung volume (EELV). The absolute values of FEV1, IC, Pimax, and dyspnoea under baseline conditions and after salbutamol, both at rest and at the end of exercise, are shown for COPD patients with (FL) and without (NFL) resting tidal EFL in table 2. Following salbutamol the increase in IC at rest (ΔIC) amounted to 388 ml (95% CI 270 to 506) in FL patients, corresponding to an increment of 24% (95% CI 15 to 33) (table 2, fig 1). In three FL patients, however, this increment was lower than 10%. In NFL patients ΔIC was 39 ml (95% CI –17 to 95), corresponding to an increment of 2% (95% CI –1 to 5). After salbutamol IC increased significantly only in the FL group (p<0.001; table 2). After salbutamol Pimax increased by 11 cm H2O (95% CI 3 to 18) in FL patients (p<0.01) and 2 cm H2O (95% CI –1 to 4) in NFL patients (table 2). Although this increment was greater in FL than in NFL patients, amounting to 21% (95% CI 6 to 36) and 4% (95% CI –1 to 8), respectively, the difference was not statistically significant (p=0.08). The average workload performed during the steady state exercise was equal to 34 watts (95% CI 27 to 41) and 31 watts (95% CI 21 to 40) (NS) for NFL and FL patients, respectively. Following the administration of bronchodilator, dyspnoea did not change at rest and at the end of exercise in NFL patients (ΔBorg,rest = 0.1 (95% CI –0.2 to 0.4); ΔBorg,exercise = –0.4 (95% CI –1.0 to 0.1)) but decreased at rest and during exercise in FL patients (ΔBorg,rest = –0.2 (95% CI –0.4 to 0.0), NS; ΔBorg,exercise = –1.1 (95% CI –1.9 to –0.4), p<0.01; table 2, fig 2). However, the decrease in exertional dyspnoea was significantly greater (p<0.05) in the FL than in the NFL group only when three FL patients with ΔIC of <10% after salbutamol were discarded. Changes in dyspnoea following bronchodilator (ΔBorg) before (rest) and at the end of a steady state light exercise (exercise) in non-flow limited (NFL) patients with COPD, flow limited (FL) patients with COPD, and flow limited patients with COPD with an increase in IC of >10% after salbutamol (FL ΔIC >10%pre) at rest. Columns are means and bars represent SE. 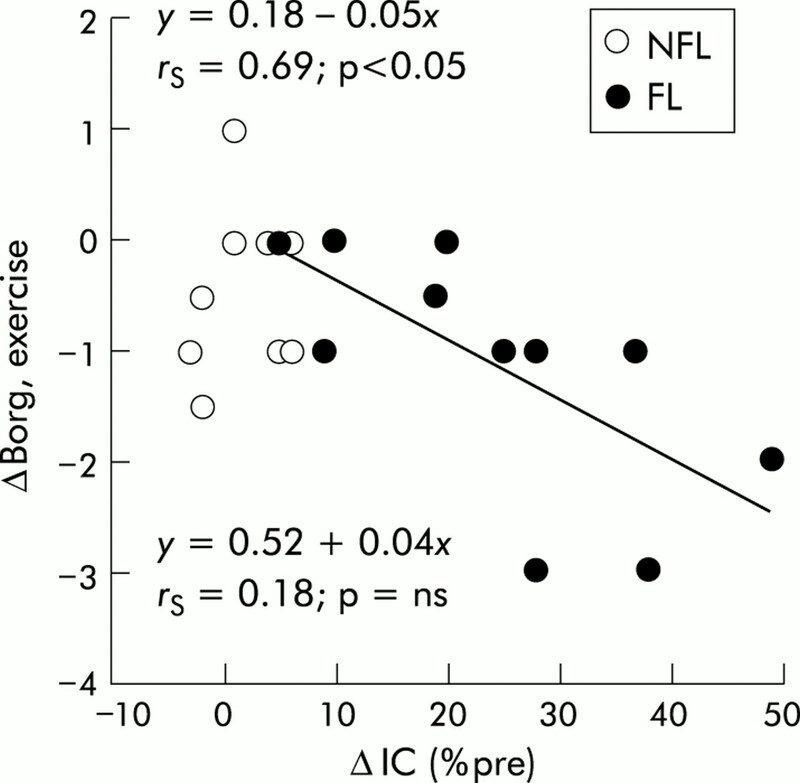 §p<0.01 v corresponding ΔBorg at rest; *p<0.05 v ΔBorg at exercise in NFL. A significant relationship between ΔBorg at the end of exercise and changes in resting IC, as a percentage of the baseline value (ΔIC %pre), was found in FL patients after salbutamol (rS=0.69; p<0.05). 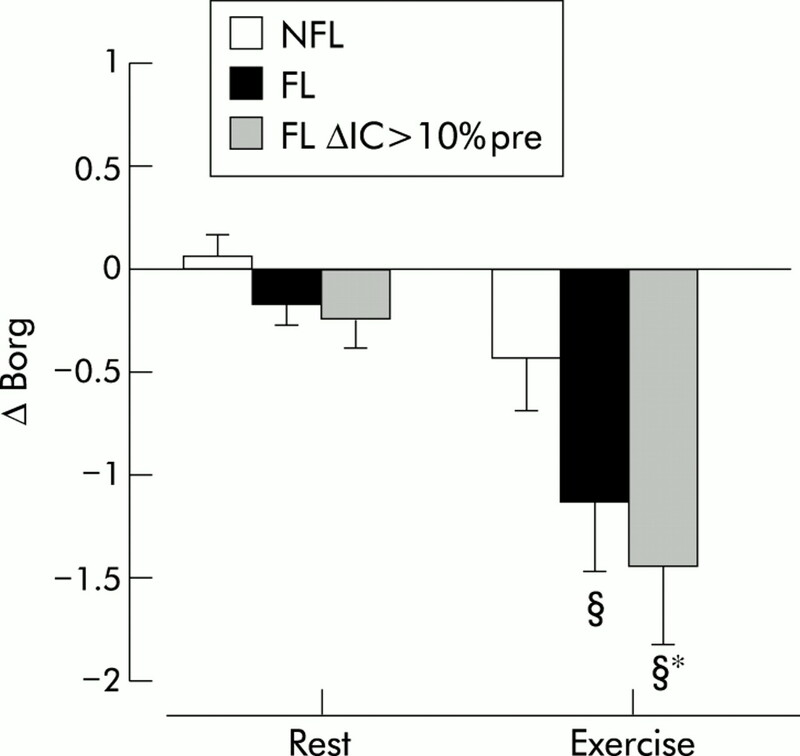 In contrast, no correlation between ΔBorg at the end of exercise and ΔIC was observed in NFL patients (rS=0.18; NS, fig 3). Relationship between reduction in resting IC (ΔIC %pre) and decrease in exertional breathlessness during light exercise (ΔBorg,exercise) after bronchodilator in 20 patients with COPD. A significant correlation was present only in those with tidal expiratory flow limitation at rest. NFL=non-flow limited; FL=flow limited. The main finding of this study is that bronchodilators may reduce breathlessness during light exercise in patients with moderate to severe COPD more in those who exhibit resting tidal EFL than in those who do not. After a bronchodilator a decrease in the exertional dyspnoea is associated with an increase in IC and Pimax at rest in FL patients. The study design did not include a placebo. Although this might be considered a limitation in interpreting the results, we think this is not the case because the bronchodilating properties of salbutamol are not in question so functional changes following its administration cannot be considered fortuitous. Nevertheless, a simple placebo effect in reducing exertional dyspnoea after salbutamol might be present in patients with COPD irrespective of their functional changes, although this possibility has been ruled out in a previous study of a similar group of patients.21 We were interested in studying the differences between FL and NFL patients in dyspnoea after salbutamol, both at rest and after exercise, rather than in assessing the effective change in breathlessness due to the administration of the drug in either group of patients. Although we cannot exclude a placebo effect in the reduction in breathlessness claimed by our subjects after salbutamol, we assume that it would be similar in the two groups and would not be a factor in the different changes in dyspnoea seen in FL and NFL patients with COPD. It is conceivable that exercising at 33% of the predicted maximal workload might represent a relatively different level of effort for different COPD patients, but this would apply to both NFL and FL groups who were comparable in terms of standard lung function tests (table 1). We wanted to assess the difference in breathlessness claimed by the NFL and FL patients with COPD faced with a relatively mild but similar absolute workload (e.g. 34 v 31 watts) in an attempt to validate the hypothesis of more dyspnoea during exercise and a larger reduction after bronchodilator in the FL group. The aim of the study was to compare the decrease in exertional dyspnoea after salbutamol between NFL and FL patients with COPD, with each subject acting as their own control. Under baseline conditions the mean Borg score at the end of exercise amounted to 2.9 (95% CI 1.6 to 4.1), indicating a mild to moderate effort in our patients. In a previous study Belmann and coworkers showed that the decrease in dynamic hyperinflation—with the favourable effect on dynamic lung volumes, inspiratory pressure reserve, and neuroventilatory coupling—was the key determinant in the reduced breathlessness reported by patients with moderate to severe COPD at the end of symptom limited incremental exercise testing after administration of a bronchodilator.21 It may be preferable for these patients to have their dyspnoea reduced after a bronchodilator during daily living activities as soon as the ventilatory demand increases, or even at rest, rather than at their maximal performance. The results of this study indicate that this can happen in patients with COPD with EFL at rest in whom administration of a bronchodilator may induce a decrease in baseline EELV (fig 1). A significant relationship was found in the FL group between ΔBorg at the end of exercise (ΔBorg,exercise) and ΔIC (% pre) at rest after salbutamol, regardless of the change in FEV1 (fig 3). In patients with COPD the reduction in breathlessness during mild to moderate exercise following the administration of a bronchodilator is heralded by an increase in resting IC which may occur only in the presence of tidal EFL at rest (figs 1 and 3). It should be noted, however, that not all patients with resting tidal EFL exhibit a relevant increase in IC (>10% compared with baseline) after salbutamol,12 as shown by three FL patients (fig 3). This finding suggests that, in some patients with COPD, either tidal EFL at rest may not be associated with some pulmonary dynamic hyperinflation or β2 agonists have no appreciable bronchodilating effect. In fact, only by removing the three FL subjects with ΔIC <10% following salbutamol in a post hoc analysis was the difference in ΔBorg,exercise after salbutamol statistically significant between the FL and NFL patients (fig 2). It follows that assessment of the changes in IC after bronchodilators in patients with COPD with EFL at rest may represent an objective tool for prescribing these drugs to attain symptomatic improvement and better quality of life, even in the absence of a significant increase in FEV1. Pimax increased after salbutamol only in FL patients. This observation is consistent with previous reports showing an increase in the inspiratory muscle strength following β2 agonists in patients with COPD.21,31 Our data strongly suggest, however, that this effect is caused by the decrease in EELV with a better force-length relationship of the diaphragm, rather than by the inotropic action exerted by the sympathomimetic drugs on the inspiratory muscles.32,33 Any increase in Pimax is thought to reduce dyspnoea in COPD patients by increasing the reserve force of their inspiratory muscles and decreasing the Pibreath/Pimax ratio.9,10 The augmented Pimax may contribute to the reduction in breathlessness during exercise experienced by FL patients after salbutamol. In conclusion, dyspnoea during light effort needed for daily living activities may be effectively reduced by bronchodilators, even without significant reversibility of the bronchial obstruction, in patients with COPD with resting tidal EFL. This symptomatic benefit is closely related to the increase in IC at rest, which probably reflects a decrease in dynamic hyperinflation, and is associated with a greater Pimax. The authors thank Mr Michele Guerini for invaluable technical assistance. This study was supported in part by MURST of Italy. Fry DL, Hyatt RE. Pulmonary mechanics: a unified analysis of the relationship between pressure, volume and gas flow in the lungs of normal and diseased subjects. Am J Med1960;29:672–89. Koulouris NG, Valta P, Lavoie A, et al. A simple method to detect expiratory flow limitation during spontaneous breathing. Eur Respir J1995;8:306–13. Eltayara L, Becklake MR, Volta CA, et al. Relationship between chronic dyspnea and expiratory flow limitation in patients with chronic obstructive pulmonary disease. Am J Respir Crit Care Med1996;154:1726–34. Hyatt RE. The interrelationship of pressure, flow and volume during various respiratory maneuvers in normal and emphysematous patients. Am Rev Respir Dis1961;83:676–83. Stubbing DG, Pengelly LD, Morse JLG, et al. Pulmonary mechanics during exercise in subjects with chronic airflow obstruction. J Appl Physiol1980;49:511–5. Pepe AE, Marini JJ. Occult positive end-expiratory pressure in mechanically ventilated patients with airflow obstruction: the auto-PEEP effect. Am Rev Respir Dis1982;26:166–70. Coussa ML, Guérin C, Eissa NT, et al. Partitioning of work of breathing in mechanically ventilated COPD patients. J Appl Physiol1993;75:1711–9. Bellemare F, Grassino A. Force reserve of the diaphragm in patients with chronic obstructive pulmonary disease. J Appl Physiol1983;55:8–15. LeBlanc P, Bowie DM, Summers E, et al. Breathlessness and exercise in patients with cardiorespiratory disease. Am Rev Respir Dis1986;133:21–5. O'Donnell DE. Breathlessness in patients with chronic airflow limitation. Mechanisms and management. Chest1994;106:904–12. Pellegrino R, Brusasco V. Lung hyperinflation and flow limitation in chronic airway obstruction. Eur Respir J1997;10:543–9. Tantucci C, Duguet A, Similowski T, et al. Effect of salbutamol on dynamic hyperinflation in chronic obstructive pulmonary disease patients. Eur Respir J1998;12:799–804. American Thoracic Society. Standards for the diagnosis and care of patients with chronic obstructive pulmonary disease (COPD) and asthma. Am Rev Respir Dis1987;136:225–44. Hansen JE, Sue DY, Wassermann K. Predicted values for clinical exercise testing. Am Rev Respir Dis1984;129:S49–55. American Thoracic Society. Lung function testing: selection of reference values and interpretative strategies. Am Rev Respir Dis1991;144:1202–18. Quanjer PhH, Tammelin GJ, Cotes JE, et al. Lung volumes and forced ventilatory flows. Report Working Party Standardization of Lung Function Tests. European Coal and Steel Community. Eur Respir J1993;6(Suppl 16):5–40. Cook CD, Mead J, Orzalesi M. Static volume-pressure characteristics of respiratory system during maximal efforts. J Appl Physiol1964;19:1016–22. Valta P, Corbeil C, Lavoie A, et al. Detection of expiratory flow limitation during mechanical ventilation. Am J Respir Crit Care Med1994;150:1311–7. Borg GAV. Psychophysical basis of perceived exertion. Med Sci Sports Exerc1982;14:377–81. Eliasson O, Degraff AC. The use of criteria for reversibility and obstruction to define patient groups for bronchodilator trials. Am Rev Respir Dis1985;132:858–64. Belman MJ, Botnick WC, Shin JW. Inhaled bronchodilators reduce dynamic hyperinflation during exercise in patients with chronic obstructive pulmonary disease. Am J Respir Crit Care Med1996;153:967–75. Anthonisen NR, Wright EC, and IPPB Trial Group. Bronchodilator response in chronic obstructive pulmonary disease. Am Rev Respir Dis1986;133:814–9. Guyatt GH, Townsend M, Nogradi S, et al. Acute response to bronchodilator: an imperfect guide for bronchodilator therapy in chronic airflow limitation. Arch Intern Med1988;148:1949–52. Nisar M, Harris JE, Pearson MG, et al. Acute bronchodilator trials in chronic obstructive pulmonary disease. Am Rev Respir Dis1992;146:555–9. Tweeddale PM, Alexander F, McHardy GJR. Short-term variability in FEV1 and bronchodilator responsiveness in patients with chronic obstructive ventilatory defects. Thorax1987;42:487–90. Mahler DA, Matthay RA, Synder PE, et al. Sustained release theophylline reduced dyspnoea in non-reversible obstructive airways disease. Am Rev Respir Dis1985;131:22–5. Ramirez-Venegas A, Ward J, Lentine T, et al. Salmeterol reduces dyspnea and improves lung function in patients with COPD. Chest1997;112:336–40. O'Donnell DE, Webb KA. Exertional breathlessness in patients with chronic airflow limitation. The role of lung hyperinflation. Am J Respir Crit Care Med1993;148:1351–7. Koulouris NG, Dimopoulou I, Valta P, et al. Detection of expiratory flow limitation during exercise in COPD patients. J Appl Physiol1997;82:723–31. Dal Vecchio L, Polese G, Poggi R, et al. “Intrinsic” positive end-expiratory pressure in stable patients with chronic obstructive pulmonary disease. Eur Respir J1990;3:74–80. Suzuky S, Numata H, Sano F, et al. Effects and mechanism of fenoterol on fatigued canine diaphragm. Am Rev Respir Dis1988;137:1048–54. Lanigan C, Howes TQ, Borzone G, et al. The effects of beta 2-agonists and caffeine on respiratory and limb muscle performance. Eur Respir J1993;6:1192–6.